Grampy and I were really looking forward to Amara spending the night with us Saturday. I was lucky and got to see Amara a couple of times last week, even thought it wasn’t for very long. Grampy hadn’t been so lucky and he was really missing his girl. 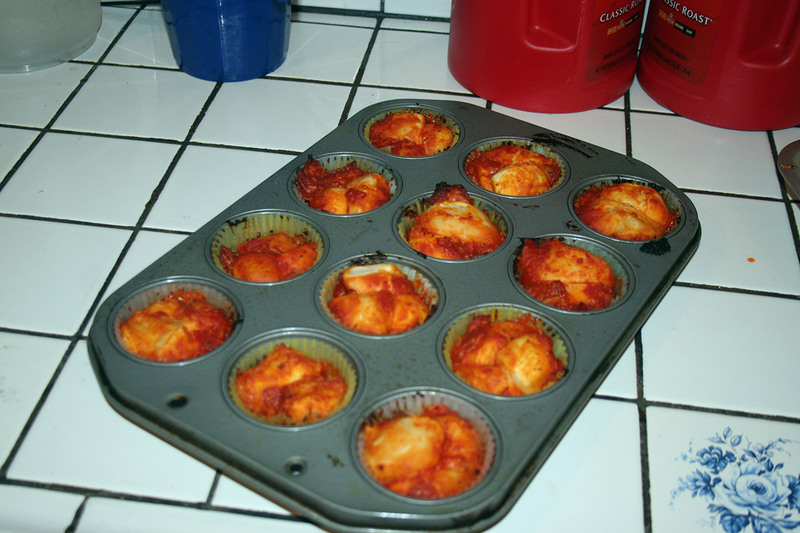 Amara and I had made big plans to try out a new recipe for Mini Monkey Bread Pizza and we were going to watch the Smurfs. Not the new Smurfs which we watched a couple of weeks ago, but season one of The Smurfs from 1981. The ones that her Mommy had watched as a girl. It was one of those times that having the DVD service with Netflix instead of the streaming only service really got us extra Grandparent Points with Amara. It isn’t available on the streaming service that her Mommy and Daddy have so I had ordered this special. 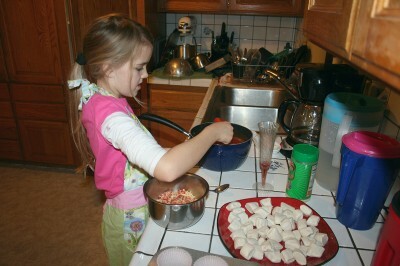 We had a blast making the Mini Pizza Monkey Breads together. 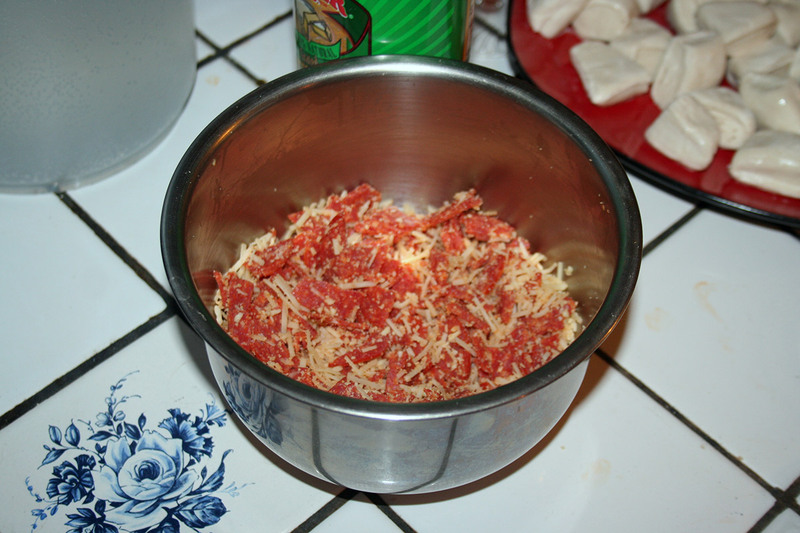 and mixed in the cheese. She helped cut up the bread dough and to line the muffin tins but when it came time to actually assemble them, she had problems! She is so her mother’s child! Jenna wears plastic gloves to debone a chicken. Amara really doesn’t like to get her fingers all yukky and sticky and this was definitely going to be very messy! The yukky sticky rule does not apply to things like finger paints, wet sidewalk chalk or buttered and cinnamoned fingers that are the result of the other Monkey Bread! 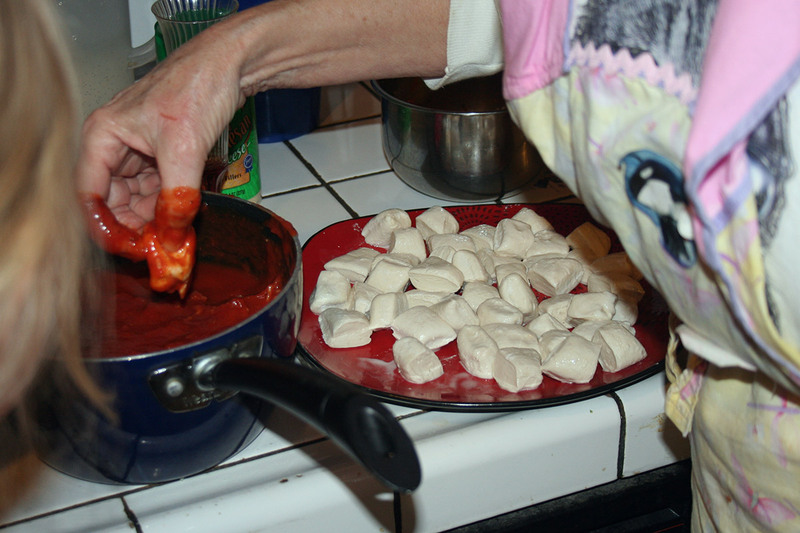 So the decision was made that Grandma would be the one to get her fingers yukky and messy. Amara would put them in the sauce — by which I means she would drop them from 12 inches up into the sauce so that they would plop and then sink and Grandma could/did fish them out! Almost lost one completely! But who cares? We were having a blast together! And they were very tasty but again, just like her Mother, she didn’t want to get her fingers all messy taking the paper off and getting them to her mouth. I helped with the papers and she ate them up. 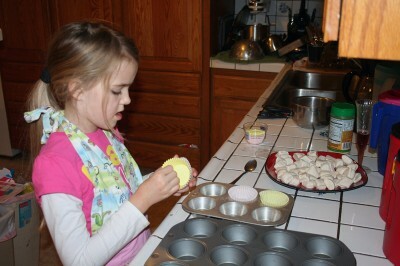 They were messy but they sure were tasty! Next time I would spray the cups better so they would come out easier. Oh, there will be a next time! I have to tell you all about the fun we had on Sunday morning. I’ll be back soon. 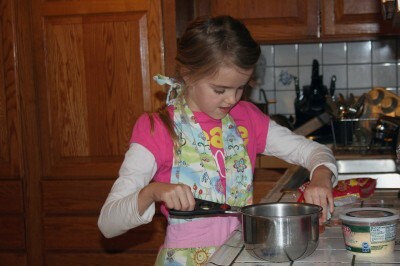 This memory was posted in Indoor Fun and tagged Amara, baking, Grandma, pizza monkey bread, The Smurfs on January 23, 2012 by Grandma Kc. 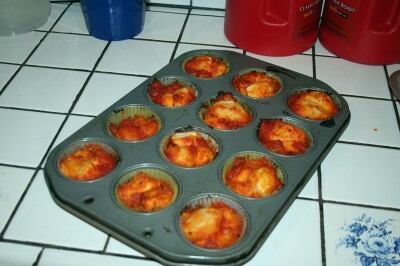 These look yummy. I will definitely try this recipe. But as for the Smurfs–I’ll pass. I never “got” the Smurfs, just as I don’t get Spongebob. What a great idea! I make monkey bread quite often, even have a monkey bread baking dish (which, honestly, isn’t any better than just using a Bundt pan). But I’ve never tried doing it pizza style. Will definitely put it on the menu soon. I’m with Amara on ‘not getting your fingers all sticky and yucky’! 🙂 These little pizzas look and sound yummy! We’ll have to give them a try! ok that’s it….I have to get some lunch now after reading this! Suddenly Starving in Pa…..